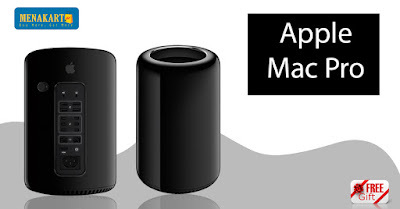 Enjoy seamless performance with Apple Mac Pro ME253 with its newly cylinder design which allows it to be a professional workstation that can actually sit on your desk. It is powered by Quadcore 3.5 GHz Intel Xeon E5 processor which is supported by 12 GB RAM with 10 MB L3 cache which gives you flawless performance and stunning gaming experience. Apple Mac Pro is powered by Intel Xeon E5 quadcore processor for smoother performance and supported by 12 GB DDR3 RAM with 12 MB L3 Cache which gives you a consistant speed of 3.7 Ghz for flawless performance during gaming, browsing or; multitasking. It has 256 GB SSD capacity for storing all your data such as music, videos and other files. Mac Pro ME253 comes with a variety of connectivity options such as four USB 3.0 Ports for connecting Mouse, Keyboard etc., 1 HDMI port, 6 thunderbolt 2 ports, Headphone/Microphone Port. It comes with in-built 802.11ac wi-fi and bluetooth v4.0 Connectivity Options. Apple Mac Pro ME253 comes with Dual AMD FirePro D300 Graphics Processor with 2 GB of GDDR5 discrete VRAM and 1280 stream processors. With the Mac Pro, Apple engineered an even more powerful GPU architecture from which you can play full resolution 4K videos seamlessly while simultaneously rendering effects in the background.